Quel temps fait-il Berthe? introduces children to the French vocabulary for different types of weather and clothing. Berthe is going outside but the weather keeps changing - and therefore so does her choice of clothes! The simple French sentences and delightful pencil illustrations will appeal to early readers. There is a simple weather pairs game to photocopy and play, a wordsearch and a French-English word list containing all of the words featured in the story. The French-language text in this book is simple as it is aimed at beginners. Great just right for practicing easy French. U.S. first grade class (immersion French program) loved this and all three Berthe books I purchased. Appropriate-level vocabulary, engaging, with amusing and clear illustrations. 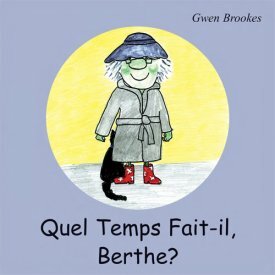 An other excellent fun book suitable for ks2 French which can be used for different activities to cater for all abilities.